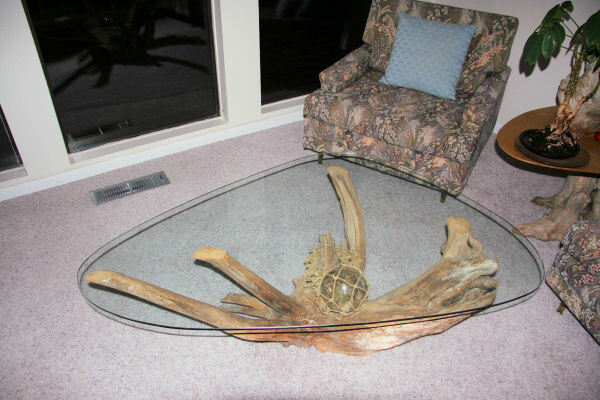 This coffee table came from an Oregon Beach. We found in half buried in the sand just north of Ona Beach State Park. When we found it, it had much more wood than shown here. Bernice and sawed some off but it wouldn't fit in the car very well. So we put it into the car in the front seat. That meant Bernice had to ride in the backset all the way back home to California. We lived in California at that time. We bought the glass in Alameda after much painful decisions as to the size. The glass float we found on the Oregon Coast one day when we went fishing. You can see our driftwood table lamp in the background.